Have you ever wondered what to do with the rest of the apples after you’ve gone apple picking, baked apple pies, and tried to consume as many apples as possible? Well, Zoe and I came up with a few fun ideas after our apple picking trip! Last week we went to the Barden Family Orchard, a lovely orchard twenty minutes away from Brown’s campus. Somehow we decided that two bags filled to the brim with apples would be just enough for us to bake with, with a couple of apples left over for us to eat during the week. Oh boy were we wrong! After using our haul in as many ways as possible, we only went through half of one bag! But don’t worry, you can use apples in other dishes besides apple pie. 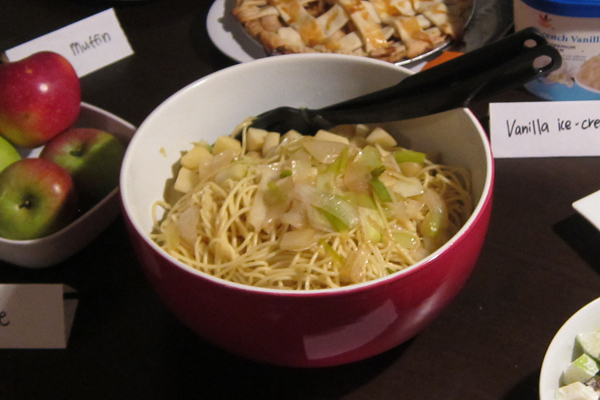 Check out our apple recipe box, and try this delicious apple pasta (featured below)! Julie Sophonpanich is a senior at Brown University where she studies History of Art and Architecture. She works a side job hosting family dinners in her apartment as well as cooking and baking with her friends. Prepare your apples and vegetables. Heat 1/2 tablespoon of butter in a pan on medium-high until it melts. Add sliced onions and sautee for 2-3 minutes or until brown. 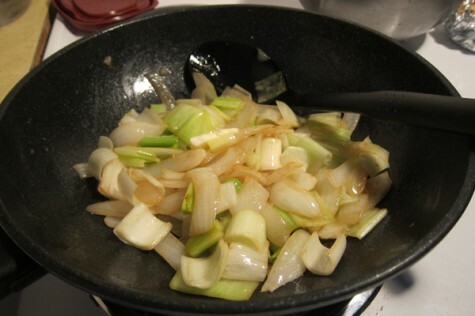 Add the leeks into the pan and cook for another 2-3 minutes. Add the rest of the butter and let it all cook for another minute. Add the diced apples into the pan and let it all simmer on low heat for 10 minutes, stirring occasionally. If possible, cover the pan with a lid to keep the the ingredients moist and the flavors intact. While waiting for the sauce to cook, bring a large pot of water to a boil. Add the pasta into the pot of boiling water. Add one tablespoon of salt. Cook the spaghetti for 10 minutes until al dente. Once the spaghetti is cooked, drain the water out from the pot. Add 1 tablespoon of olive oil to keep it from sticking together. Keep the pasta and sauce separate until right before it is almost ready to serve. When ready to serve, pour the sauce into the pot of pasta and stir the entire mixture until it is evenly hot. Serve in a large bowl. Categories: Blog, Campus Cooking, Eating, Green Living, and Recipes. I'm Cooking For...: Dates, Dinner Party, Easy Dinner, and Potluck. hmm – sounds yummy! Once again you have shown your creative side – only wish I get a taste of some of these soon!